The carbon cycle is responsible for allowing life to continue on Earth. Without this cycle, carbon would not be recycled, resulting in the inability for living things to survive. Carbon is found all over the universe, making it the fourth most plentiful element. It also helps to determine whether a molecule is inorganic or organic. Humans are half carbon when water is discounted. 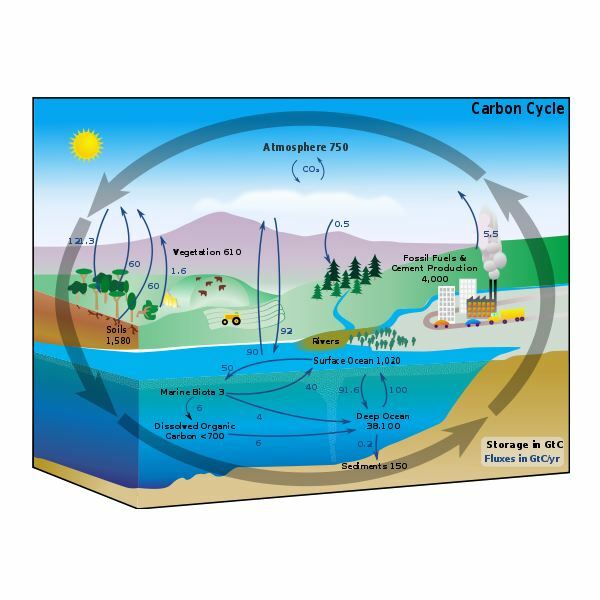 This cycle is a process in which the many forms of carbon move between the oceans, atmosphere, geosphere and biosphere. This cycle includes many carbon storage pools and the processes in which carbon is exchanged in the various pools. A net carbon sink occurs when more carbon comes into the pool, than leaves it. A net carbon source occurs when more carbon leaves the pool compared to how much enters it. This cycle can be divided into biological and geological components and it is considered a major biogeochemical cycle. The geological carbon cycle's time scale is millions of years, while the biological carbon cycle's time scale is days and up to thousands of years. This cycle's geological component occurs when the processes of volcanism, weathering and dissolution, burial and subduction and the precipitation of minerals interacts with the rock cycle. This process creates calcite sediment which eventually forms into a rock known as limestone. As this cycle continues, atmospheric carbon dioxide concentrations are controlled by subduction, weathering and volcanism over the course of hundreds of millions of years. Biology plays an integral part in the movement of carbon between ocean, land, and atmosphere through respiration and photosynthesis. Photosynthesis is a process in which sunlight and carbon dioxide produce sugars. Respiration is the metabolic breakdown of those sugars. Once the sugars are broken down, the energy needed for growth, movement and reproduction is produced. Over the last 150 years, a long-term rise in carbon dioxide has occurred because of humans. The activities that have most contributed to this rise include deforestation and the burning of fossil fuels. Burning coal and oil results in carbon dioxide being released into the air much quicker that it's being removed, resulting in an increase in atmospheric carbon dioxide concentrations. Due to this increase, the global climate has risen 0.6 degrees Celsius over the past century. If humans continue on with deforestation and consuming fossil fuels, this global warming trend is likely to continue. This could result in a global temperature increase of 1.4 to 5.8 degrees Celsius over the next 100 years. A temperature rise this significant will lead to many serious global changes, such as the average sea level rising significantly (0.09 to 0.88 meters) which could result in low-lying cities, such as Portland, New Orleans, Philadelphia and Washington to severe, frequent floods.